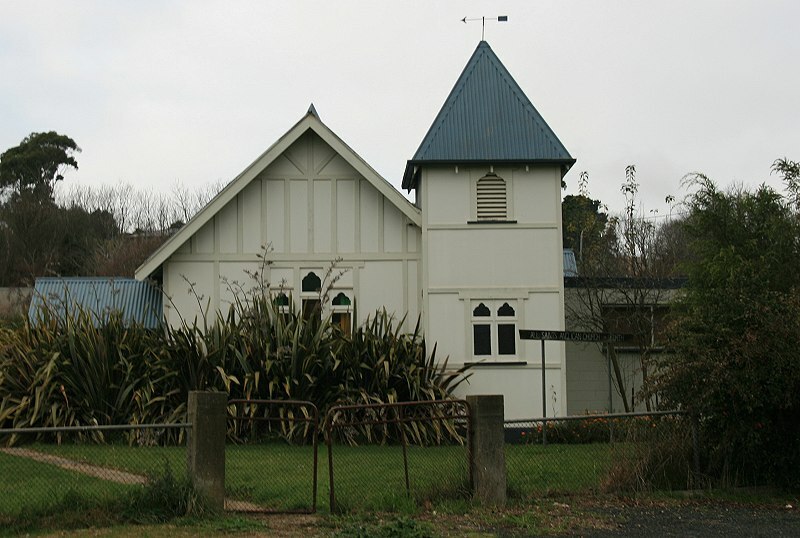 The first Anglican church was opened in 1868, near the site of the cemetery (Google Maps, but was later moved to a more central location. In 1933 it was destroyed by fire, and the current building was constructed. A Bazaar was held at the Forth, on Thursday week, to help the funds of the new Church lately erected there. Despite the bad weather, &c, the attendance was very good, and fancy articles were disposed of to the amount of £52, a sum really to be wondered at, considering the dulness of the times. The Amateur Minstrel Band was engaged for the occasion, and dispensed sweet music, at intervals, from the store adjacent to the Bazaar Booth, and all went merry as a marriage bell. Outside, the young folks enjoyed themselves with football and cricket until the shades of evening fell. Taking the inclemency of the weather, hard times, &c., into consideration, the Forth Bazaar was a decided success. A new place of worship at the Forth in connection with the Church of England, was opened for Divine service on 27th April.